You may say that the goyim will rise upon us, arms in hand, if they guess what is going on before the time comes; but in the West we have against this a manoeuvre of such appalling terror that the very stoutest hearts quail -the undergrounds, metropolitains, those subterranean corridors which, before the time comes, will be driven under all the capitals and from whence those capitals will be blown into the air with all their organizations and archives. Rabbi Yitzchok said: The year that Melech HaMoshiach will be revealed, all the kings [leaders] of the nations will be struggling against each other. The leader of Persia will contest with the leader of Arabia, and the leader of Arabia will go to Rome [the leading modern-day Western superpower] to get council from them. The leader of Persia will respond and act to destroy the entire world. All the nations of the world will be trembling and shaking and falling on their faces. They will be seized by labor-like pains. What is interesting is that the Medrash contrasts Persia with Arabia. Why would the Medrash make a distinction between Arabic Iran (Persia), and another Arab country, Arabia? Why would the Medrash speak about a war amongst kindred Arab nations? And finally, why would Arabia consult with the leading Western superpower? This Medrash is startling and mind-boggling. While Iranians are Muslim, they are not true Arabs, i.e., they are not Semites; they stem from Yafes and are Indo-European. This is precisely why the Medrash contrasts Iran, non-Arabs, with the rest of the Arab world. The Iranians are largely Shiite Persians. Arabia may refer to Saudi Arabia, the leading Sunni country in the Middle East. The Saudis and Iranians both seek to dominate the Middle East and lead the Muslim world. Their growing rivalry is a major factor in world politics. President Mahmoud Ahmadinejad’s nuclear ambitions, combined with Iran’s sponsorship of the Shiite Hezbollah militia in Lebanon, its backing of Hamas, and its uprisings in Iraq, is proof to Arab leaders that their old Persian rivals are determined to reshape the Middle East (and the world). As early as 2004, Jordan’s King Abdullah warned of a rising Shiite “crescent” running from Iran through Iraq and Syria to Lebanon. Saudi Arabia is concerned about a nuclear Shiite Iran. Therefore, they are dependent on America, the leading country attempting to stiﬂe Iran’s nuclear pursuits, which could explain the part of the Medrash in which Arabia consults modern-day Rome. This Medrash patently teaches that the Iranian threat is a definite signpost and prelude to Moshiach. King Salman of Saudi Arabia on Friday will make his first visit to the White House since acceding to the throne in January, a meeting that comes as the long-time allies find themselves at odds on several issues, particularly over Iran’s increased role in the region. Those differences notwithstanding, analysts say the meeting between the king and President Barack Obama is meant to reaffirm the nations’ relationship, even if it is unlikely that anything substantive will result. “On both sides it’s less about deliverables and more about the atmospherics,” said F. Gregory Gause III, head of the international affairs department at Texas A&M University’s Bush School of Government and Public Service. The regional impact of the Iran nuclear agreement that the U.S. and five world powers concluded with Tehran in July is at the top of the agenda. That agreement cleared one of the last remaining hurdles this week, when President Obama secured enough legislative votes to prevent a Congressional resolution that could have derailed it. “Now that the deal with Iran is over, the administration wants to reassure allies,” said Gause. Obama has been reaching out to them since May, when it first appeared that the Iran nuclear deal was within grasp. The U.S. sought to reassure Gulf Arab countries at a Camp David summit by strengthening ties with the Gulf Cooperation Council (GCC), of which Saudi Arabia is by far the most powerful member. King Salman, however, declined to attend the summit and sent his crown prince and deputy crown prince instead, a move interpreted by analysts as a snub to Obama. Washington’s Gulf allies have lent public support to the Iran deal since then, despite reservations over Tehran’s regional ambitions, assuaged in part by an increase in U.S. military and logistical support. “We’re determined that our Gulf friends will have the political and the military support that they need,” Secretary of State John Kerry said during a speech on Wednesday. Kerry defended the nuclear agreement to Gulf states as limited to arms control and necessary to address shared concerns about Iran’s regional ambitions. While Saudi Arabia appears prepared to accept the nuclear deal, it remains critical of the Obama administration’s diplomatic efforts, which it fears could be part of a broader U.S. strategic détente with Tehran. The U.S.-Saudi relationship already showed signs of fraying during the leadership of the late King Abdullah. Obama and Abdullah clashed over the U.S. withdrawal of support to former Egyptian strongman Hosni Mubarak during the Arab Spring. The relationship was strained further over U.S. reluctance to more forcefully commit to ensuring the removal from power of the Iranian-backed Syrian government of Bashar al-Assad in the course of the Syrian civil war. Those disagreements have continued under King Salman. However, unlike his predecessor, who was cautious not to diverge far from U.S. regional policy, the new king appears comfortable taking a more proactive role in the region. That was typified by the Saudi decision in March to launch a bombing campaign in Yemen to support Saudi-backed Yemeni President Abd Rabbu Mansour Hadi, who fled to Riyadh after Yemen’s government was taken over by Houthi rebels. Saudi and its GCC allies view the rebels as an extension of Iranian influence in the region. The U.S. has backed that effort, and provided logistical and intelligence support to Saudi-led efforts, but public statements pressing for a political resolution to the conflict and efforts to underscore the humanitarian impact suggest only tepid U.S. support for the campaign, which shows no signs of abating. Human rights groups and critics of the war in Yemen say Obama should use Friday’s meeting to press for an end to the fighting, which has so far killed more than 2,000 civilians and left the country on the brink of a humanitarian catastrophe, according to the United Nations. Pay Attention America, for you are being led like sheep to the slaughter all the day long. Who is the ONLY POWER in the MID EAST who has Nuclear Capability? That is right Itsreallyhell. And guess what Major Capitols of the earth they target? So then, prepare for yet another False Flag attack, possibly using a Nuclear Weapon, possibly in New York, destroying hundreds of thousands and possibly millions, to bring in their final War and their Moshiach, the Man of SIN, Son of Perdition, False Christ, and very soon. King Salman of Saudi Arabia meets Obama in Washington, his first visit to the United States since assuming the throne. 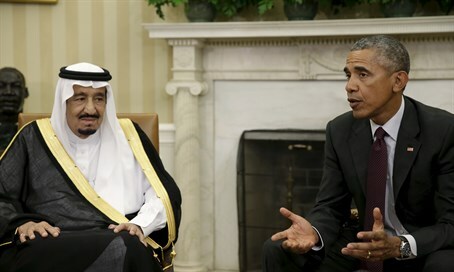 King Salman of Saudi Arabia on Friday met President Barack Obama in Washington, on his first trip to the United States since assuming the throne in January, the BBC reported. During the meeting, according to the network, the king reiterated the concern of Gulf states over the recent deal on Iran’s nuclear program. Gulf states had been repeatedly expressing their concern about the terms of the nuclear deal with Iran, warning that a final agreement could allow Iran to keep the technologies needed to produce nuclear weapons. They did, however, say they support the deal during a recent visit to the region by Secretary of State John Kerry. According to the BBC, Obama pressed King Salman to ensure humanitarian organizations are given unrestricted access to Yemen, where the Saudis are leading a coalition against the Houthi rebel movement. “We share concerns about Yemen and the need to restore a function government that is inclusive and that can relieve the humanitarian situation there,” Obama said after the meeting. The Obama administration has vowed to make certain that Iran abides by its commitments under the nuclear deal and to do everything it can to “counter Iran’s destabilizing activities” in the Middle East once the country’s estimated $56 billion of frozen assets are released. In an effort to reassure its Gulf allies, the United States has been working with them to develop a ballistic missile defense system, provide special operations training, authorize arms transfers, strengthen cyber security, engage in large-scale military exercises, and enhance maritime operations to halt illegal Iranian arms shipments, noted the BBC. Before the meeting, The Associated Press (AP) reported that the Obama administration would greet King Salman with assurances that the Iran nuclear deal comes with the necessary resources to help check the Islamic Republic’s regional ambitions. There were reports of a strain in the relations between Washington and Riyadh several months ago, when King Salman skipped a summit of Persian Gulf leaders with Obama, in which the president offered the Gulf leaders reassurances over the nuclear deal with Iran. Saudi Arabia’s foreign minister later insisted that King Salman’s last minute decision not to attend the summit was not intended as a snub to the United States. The Saudi point of view on Iran is a rare acknowledgement of agreement between Israel and Saudi Arabia, which have no formal diplomatic contact but have reportedly been growing more cooperative as the deal has progressed. Rabbi Yitzchok said: The year that Melech HaMoshiach will be revealed, all the kings [leaders] of the nations will be struggling against each other. The leader of Persia will contest with the leader of Arabia, and the leader of Arabia will go to Rome [the leading modern-day Western superpower] to get council from them.The leader of Persia will respond and act to destroy the entire world. All the nations of the world will be trembling and shaking and falling on their faces. They will be seized by labor-like pains.